Brain Mapping: A Comprehensive Reference offers foundational information for students and researchers across neuroscience. 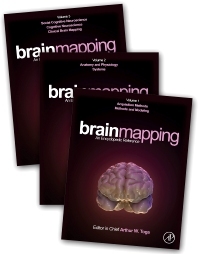 With over 300 articles and a media rich environment, this resource provides exhaustive coverage of the methods and systems involved in brain mapping, fully links the data to disease (presenting side by side maps of healthy and diseased brains for direct comparisons), and offers data sets and fully annotated color images. Each entry is built on a layered approach of the content – basic information for those new to the area and more detailed material for experienced readers. Edited and authored by the leading experts in the field, this work offers the most reputable, easily searchable content with cross referencing across articles, a one-stop reference for students, researchers and teaching faculty. How Does Fiber Tracking Work? How to Find the Best Transformation? Inference of New Models of the Folding Pattern? What Is the Optimal Number of Folds? What Are the Alternatives to Crossvalidation and What Are Their Advantages and Disadvantages? What Is a Network Hub? Are the Cortical Hubs and Their Functional Streams the Basis for Evolved Cognitive Capacities in Humans? What Does Human Neuroimaging of Central Autonomic Control Offer? Duration Estimation or Temporal Attention? What Is the Function of the Brain Regions That Support Self-Knowledge? Are There Brain Regions Necessary for Mentalizing? What is Social in Social Decision Making? What Defines an "Inhibitory Motor Area"? Can Neuroimaging Test Perceptual Decision Mechanisms at the Columnar Level? What Is Unique About Reading in Functional Terms? What Is ‘Remote Dysfunction’ and What Is It Not? How Can Remote Dysfunction Be Detected? How Can Diaschisis Be Evidenced in the Human Brain? Can Diaschisis Be Structurally Imaged? What Has Neuroimaging Contributed to Our Understanding of Emotion? HOW Is Functional Paralysis Produced? WHY Is Functional Paralysis Produced? Are There Common Central Mechanisms for Chronic Pain? Arthur W. Toga is the Director, Laboratory of Neuro Imaging, Director, Institute of Neuroimaging and Informatics, Provost Professor, Departments of Ophthalmology, Neurology, Psychiatry, and the Behavioral Sciences, Radiology and Engineering at the Keck School of Medicine of USC. His research is focused on neuroimaging, informatics, mapping brain structure and function, and brain atlasing. He has developed multimodal imaging and data aggregation strategies and applied them in a variety of neurological diseases and psychiatric disorders. His work in informatics includes the development and implementation of some of the largest and most widely used databases and data mining tools linking disparate data from genetics, imaging, clinical and behavior, supporting global efforts in Alzheimer’s disease, Huntington’s and Parkinson’s disease. He was trained in neuroscience and computer science and has written more than 1,000 papers, chapters and abstracts, including eight books. Recruited to USC in 2013, he directs the Laboratory of Neuro Imaging. This 110-member laboratory includes graduate students from computer science, biostatistics and neuroscience. It is funded with grants from the National Institutes of Health grants as well as industry partners. He has received numerous awards and honors in computer science, graphics and neuroscience. Prior to coming to USC he was a Distinguished Professor Neurology at UCLA, held the Geffen Chair of Informatics at the David Geffen School of Medicine at UCLA, Associate Director of the UCLA Brain Mapping Division within the Neuropsychiatric Institute, and Associate Dean, David Geffen School of Medicine at UCLA. He is the founding Editor-in-Chief of the journal NeuroImage and holds the chairmanship of numerous committees within NIH and a variety of international task forces.